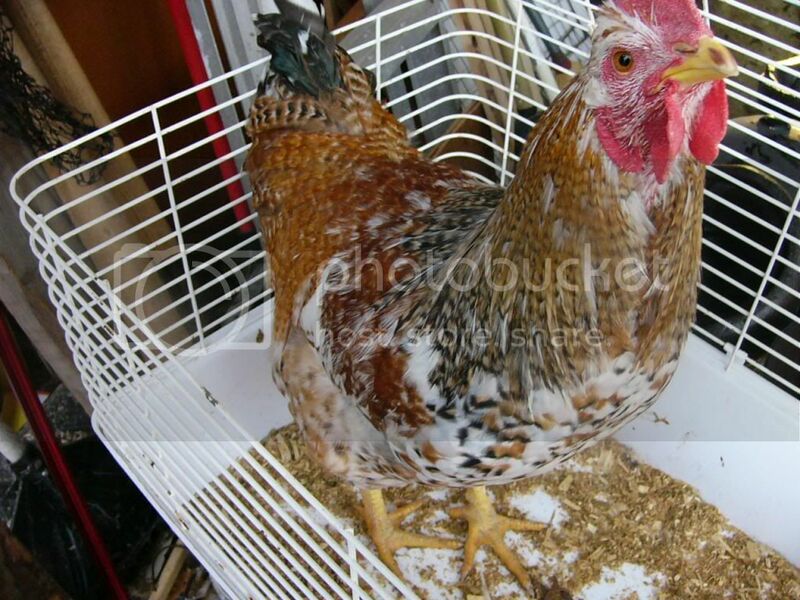 Euskal Oiloa Chicken Forum / Free to a Mille Fleur loving home EO home! » Free to a Mille Fleur loving home EO home! Free to a Mille Fleur loving home EO home! Re: Free to a Mille Fleur loving home EO home! This is the first Millie cockerel I have seen, is he ever pretty!!!! He's very nice. You will have to pair him up with the millie pullet and breed some more millies! The marraduna are nice but boy those marraduna milllies are something special. There are no other large fowl breed that are near as pretty! Someone should take up breeding them! I have had lots of millie pullets and a a few cockerels with some millie in them but none as much as this guy. Is he from Claire too? He'd get along fine with your BLRW roo. He is a lover not a fighter! I have him in a group of 20 bachelors. Real sweetie. Thanks Gubi. Yes he is from Claire too. 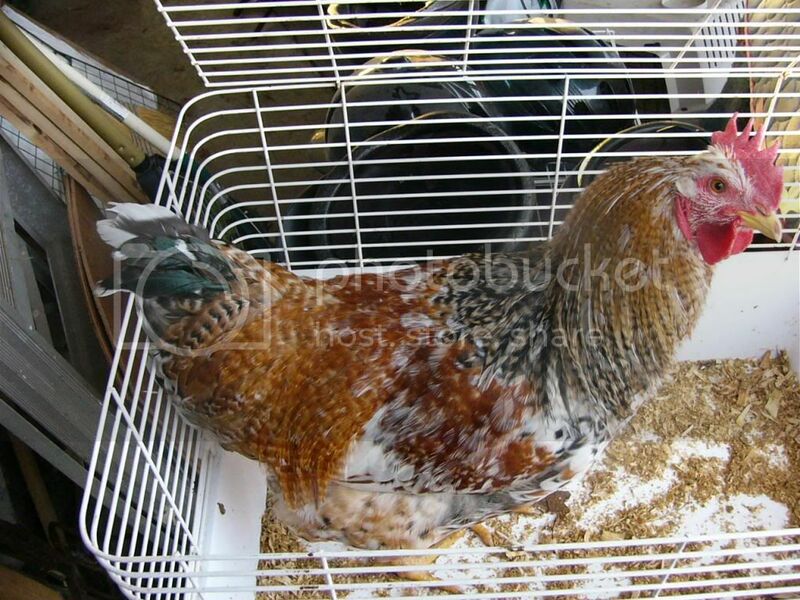 I thought he was a pullet (before you taught me the difference) and sent him off to my friend's place in town. When he started crowing he moved home to me. I have never seen a Mille boy of this age before...guess they usually get processed. Maybe we can start a new undiscovered line of Maradunnas The North American Mille Fleur. Wow what a pretty rooster! he has some really deep colours and the tight barring then all that wiite and the striking millie spots! Gorgeous. We never had any like that ever! Oh I like him he almost looks heterozygous for barring but I don't think that could be the case from Claire's EO. Too bad I wasn't closer. He looks like he has a really great personality. I plan to breed the Mille marraduna. I just love the pretty color pattern. So far I only have hens, no dedicated rooster, maybe one will pop up next year. Paula mottling is recessive I think. I need to reread those chapters in my Genetics of Chicken Colours book. And no idea when/how the trait got into the EOs. Oh my. He is so cute. I wish I could get. Him here. I have two Millie girls that would be nice for him to hang out with. Hope he can find a nice home being he sounds very rare. Well, I think we will keep him then and you've all convinced me to save him from the processing plant! Now...how do I break the news to Dennis? PG, what does hetergeneous barring mean? When I got the young EOs Claire had the one from Susan banded so that is how I am certain he is from Claire's. He is the cockeral I call Back Up. The others from Susan were Gorria boys. This Mille was very well cared for by my friend and his kids. I was really impressed with the weight, skin tone and feather health. He was well loved by my friends. If he hadn't insisted on crowing on his house every morning he'd still be there. PG, want to do an egg exchange? I will breed my Mille boy to my 3 mille pullets and ship you eggs? Claire has a great article on how to ship eggs and might give me advice so I don't mess up. I'd love to get gorria and maraduna eggs from you. Let me know! Why is it every year I say "this year I will just hatch from my own birds" and every year I am like a kid in a caddy store in the spring unable to avoid the temptation of eggs in the mail? Awe, who cares, it's so much fun! I'd keep him! What a beautifully marked bird. Love that pattern. Makes me think he is a cross with my Roo Apollo and one of my milles hens. Any chance Claire forgot to band him? What do you think Claire? If you've never had any like that, any chance his band to mark that he Susan's stock fell off? His band would have to have fallen off as I had them in separate hatches then pens for the longest time. There were some Maradunnas in Susan's eggs I think and you got 1 or 2 roos those with the Gorrias I think. He does look more like Susan's with that tight barring. Our jazziest guys looked more like Curly than anything. Anyway he was a good sport and after saying, "Sure, he can stay, just start an online Save the Mille EO by paying for his Winter Feed Fund!" He laughed. We are trying to get our numbers down to 70, like Claire has it, as it is easier to manage the flock and keep the records as detailed as I like. So the son of Apollo stays and hopefully you'll all want eggs or chicks in the Spring! Jeffery near San Angelo, Texas was discussing EO's with me a few weeks ago and looked into Penedenseca when I told him I believed that they are what our North American EO's were crossed with. I would think that one could make a strong case for a Marraduna EO x Crele Penedenseca. So...I guess that along with the Wheaton (eWh) E locus we probablly of Partridge (eb) in our EO lines. Someone was saying that one of the way to tell the difference between a Wheaton Marans and and a Partrige Marans is the undercolor. Does anyone know anythig about fluff and undercolors? Is the underfluff determined by the E Locus, or is the cream under color for wheaton and white undercolor for partrige that I read about in the Marans lines due to breed standards and selective breeding?